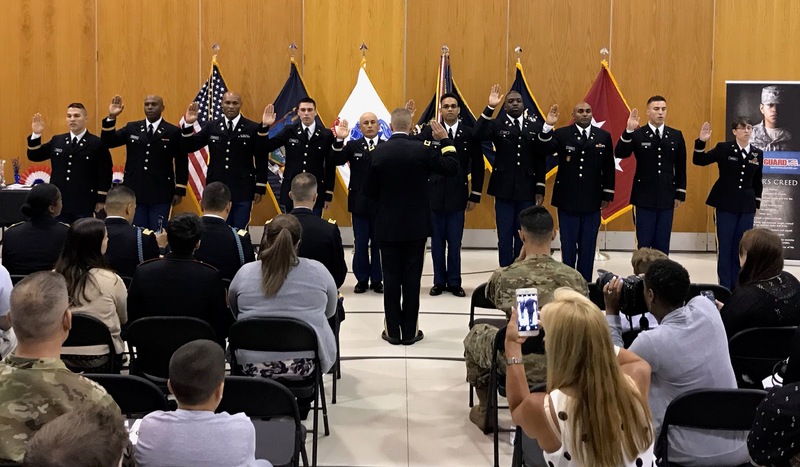 LATHAM, N.Y. -- The New York Army National Guard commissioned its newest officers August 11, 2018 following their successful completion of Officer Candidate School. Kevin Grazioplene from Oakfield, N.Y., received an officer's commission as a second lieutenant in the Military Intelligence branch and will go on to serve with the Company D, 152nd Brigade Engineer Battalion in Rochester. Officer Candidate School is a three-phase training course that lasts approximately 15 months to prepare officer candidates for the challenges and opportunities to lead Soldiers in the New York Army National Guard. Training began for this year's class in the spring of 2017 held both at Camp Smith, New York and Camp Niantic, Connecticut. Skills included physical fitness training, land navigation, road marches, warrior tasks and the fundamentals of leadership. Candidates then continued into an 11-month phase two of regular drill training to provide a foundation of Army leadership, military ethics, military justice, communication skills, military history and tactics. The final phase encompassed a two-week training session where candidates were evaluated in their leadership skills while conducting tactics in a field environment. The Officer Candidate School is administered by the New York Army National Guard's 1st Battalion, 106th Regional Training Institute and Camp Smith, New York.